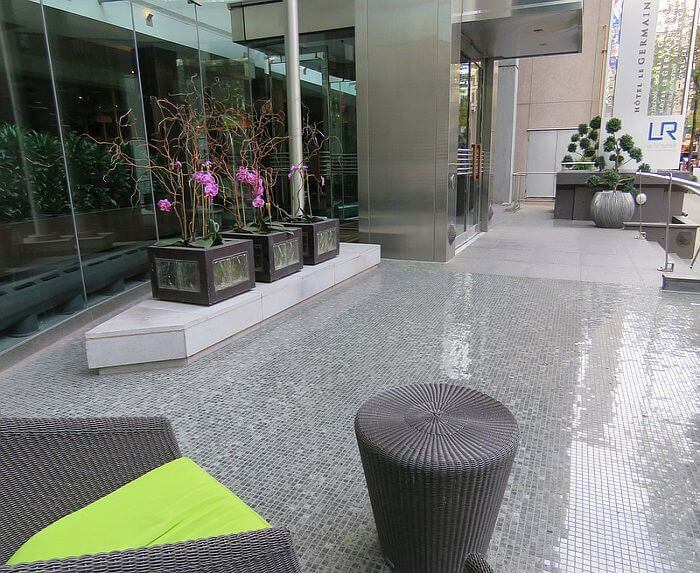 As hotel lobbies go, the lobby at Le Germain Hotel Montreal is a relatively small space, but it has a certain shimmer. A mirror here, some brightly colored orchids there and a big bowl of green apples mix together to make you curious about your room as you leave the front desk and head for the elevator. 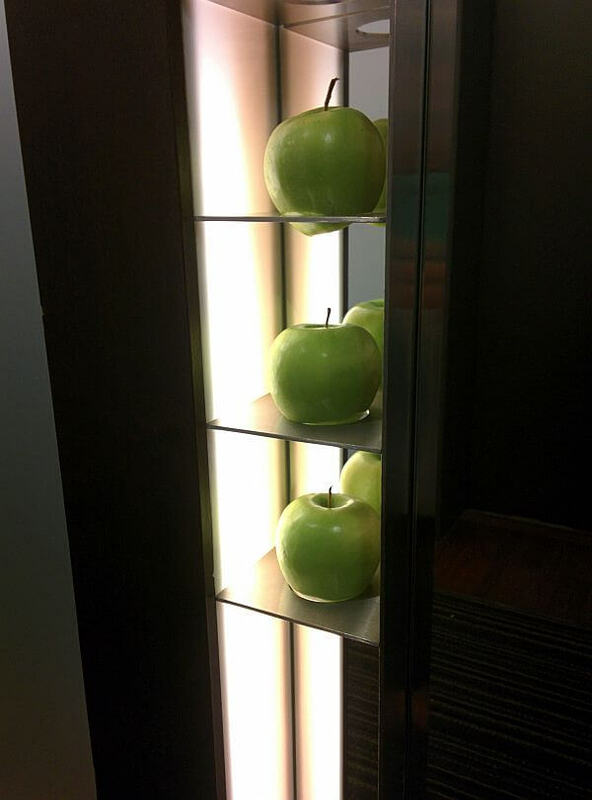 On each floor, when the elevator doors open, more mirrors turn more green apples into fresh and fun décor. Feel free to help yourself to a snack as you make your way to your room. Le Germain Hotel Montreal has 101 hotel rooms and suites. Modern furnishings and lighting give rooms a sleek look, but fluffy down comforters make rooms feel cozy as well. Comforters and pillows are filled with down with removed stems to reduce allergy issues. Synthetic bedding is also available on request. My Signature Room offered a comfortable reading area with two chairs and a nice desk space with plenty of plugs to spread out and charge electronics. Coffee drinkers will appreciate the Nespresso® coffee machine and capsules. 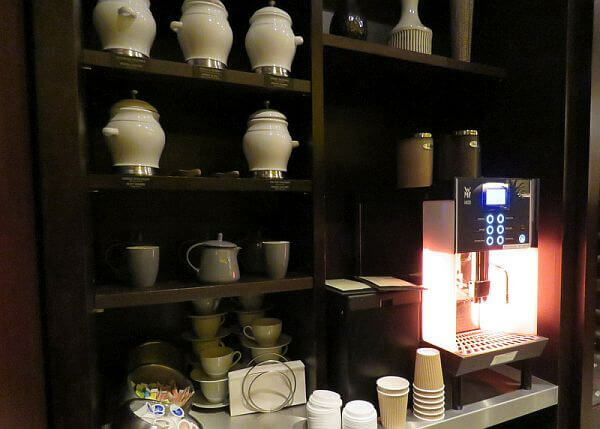 Tea drinkers will find tea bags in the room, but shouldn’t miss the tea bar in the lobby. Along with coffee and hot chocolate it offers nearly a half dozen teas from around the world. The bathroom is spacious with a vanity that offers plenty of room for toiletries. But the glass shower, complete with rainfall showerhead, will most likely be what catches your eye when you walk in for the first time. Le Germain Hotel Montreal has a small fitness center that is open 24/7, but it’s more fun to grab an apple to go and get your exercise wandering the neighborhood. McGill University is nearby. Make the short walk to popular shopping stretch Rue Sainte-Catherine and you might add a little weight to your suitcase. A generous continental breakfast is included in the price of the room. It is served on the mezzanine level every morning and includes a couple of warm selections along with cereals, fresh baked bread, chocolate bread and croissants, homemade jams, juices, tea, coffee and hot chocolate. The dining room is bright, colorful and worth getting up to see. Be sure to look up. The ceiling has a floral flair. If you need breakfast before the restaurant opens, let them know before 10pm the night before and they’ll pack a breakfast to go. On-site restaurant Le Laurie Raphaël serves lunch and dinner. Internet is free. There’s also a computer with a printer in the lobby, which comes in handy when you need a last minute boarding pass. 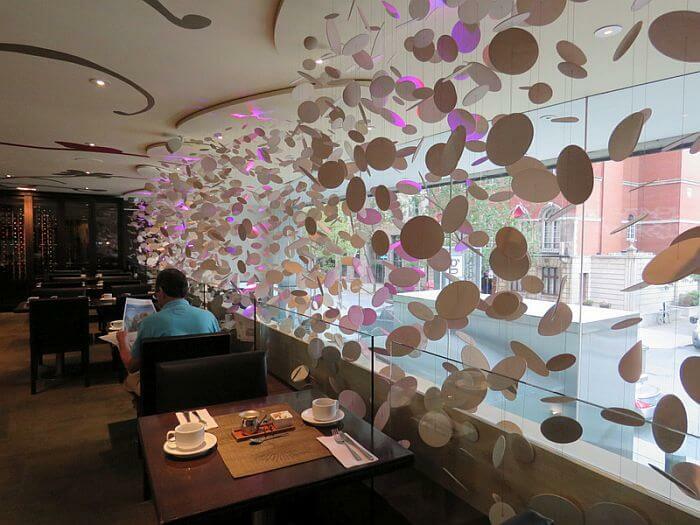 An assortment of extra perks add nice touches to a stay in Montreal. The morning newspaper is delivered free of charge to your room. If you’ve got a preference, let the front desk know when you check in. Traveling with kids? Let the hotel know in advance and they can book a babysitter to come to your room. If you are traveling with a car, indoor valet parking is available. Universal electric vehicle and Tesla charging stations are available. Le Germain Hotel Montreal is also dog friendly. There is an extra $23 fee per stay to cover room cleaning. 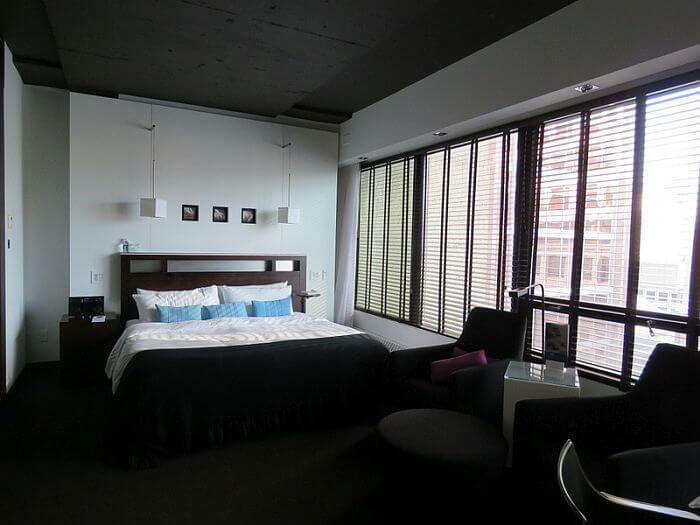 Rates for a Signature Room with a king size bed range from $182 to $220. Book directly online through the hotel website or you can make reservations through Travelocity or Hotels.com as well. Review and photos by Dana Rebmann. Her stay at Le Germain Hotel Montreal was organized by Tourisme Québec and Tourisme Montréal, but as always her thoughts and opinions are her own.